Officer Charles (“Chuckie”) Irvine Jr. End of watch: Thursday, June 7, 2018. I awoke around 1 AM the morning of June 8, 2018, to find a prayer request on my smart phone. 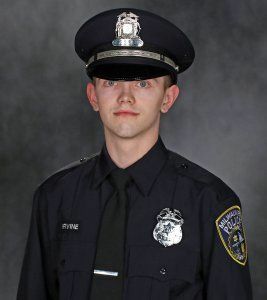 The post requested prayer for the family of Charles Irvine Jr. “Oh no,” I cried, “not Chuckie!” Visibly distraught, I soon discovered that Officer Irvine died in the line of duty after a high-speed pursuit on Milwaukee’s northwest side the previous afternoon. Amidst the devastating darkness, though, an endearing image of Chuckie emerged. After Chuckie’s year in our fourth grade community, his father died. As a fifth grader the next school year, Chuckie often stopped in my classroom during his morning break. While I taught a lesson, Chuckie quietly walked in and stood right next to me- I always kept my door open. Next, I’d pause the lesson, put my arm around him and say, “Hey Chuckie, how are you doing?” When Chuckie felt comfort in the present moment, he returned to class. Chuckie – small in stature, but big in heart. In God Is Closer Than You Think, John Ortberg affirms his belief that right now constitutes the greatest moment of your life. That’s not to imply you find the present moment happy, pleasant, or easy. Rather, right now is the only moment you’ve got. Most noteworthy, it’s God’s irreplaceable gift to you. This moment matters because God is present. To walk with God, you must experience His presence now – in this moment. Furthermore, John observes, spending the day with God usually looks no different than what you already do. However, to receive each moment as a sacrament, what John calls a God-charged sliver of grace, involves learning to do what we already do in a new way – with God! Well done, you good and faithful servant! Thank you for your service! Rest in the peace of the Lord! So glad to meet Chuckie. Bless his soul. As life gets physically more difficult I’m seeing God in countless things every day (sometimes night). He sends me more epiphanies and never ending beauty. When one’s faith is strong, this is the ultimate gift. Thank you Dave.